Hello! So what do you guys think of the Taylored Expressions release this month? So many awesome new products, right? Today the Baker's Dozen has come up with some fun Mother's Day projects to share with you, so you'll definitely want to hop around and get some inspiration! I decided to decorate one of these adorable brown paper bags for my project today. I just love the rustic/country feel and thought this gorgeous Lavender Bouquet would be the perfect image to use. I stamped the image with Memento Tuxedo Black Ink and colored it with Copics. I cut it out and popped it up over a tag I made using the new Tag Stacklets 1 Dies. I also added some fun ric racs that I cut with the new Ric Rac Borders. The dp is My Mind's Eye The Sweetest Thing Lavender. I added a paper doily, a tiny clothespin, and some stitching and called it complete! Thanks for stopping by and I hope you have a great weekend! We are heading to the Florida Gator Regionals gymnastics meet tomorrow:) Go Gators! Then it's time to finish packing. Only about 10 more days until we have to be out of our house~ACK! This is GORGEOUS, Kerri! I had to look twice as the DP almost looked like fabric. Gorgeous coloring and adorable bag, love it! Stunning gift bag, Kerri! 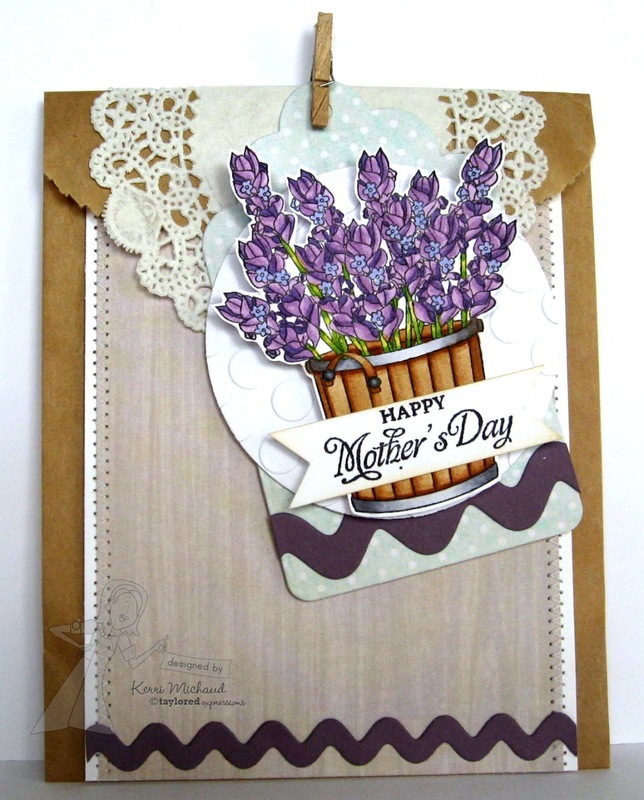 Your lavender bouquet is gorgeous! Love all the beautiful colors and textures on this bag.Gorgeous!